When you envision Oahu real estate, the ultimate daydream is always of the home by the ocean. There’s just something in the common human spirit that responds to the call of the waters, so what could be better than living near, or even on, the shore? 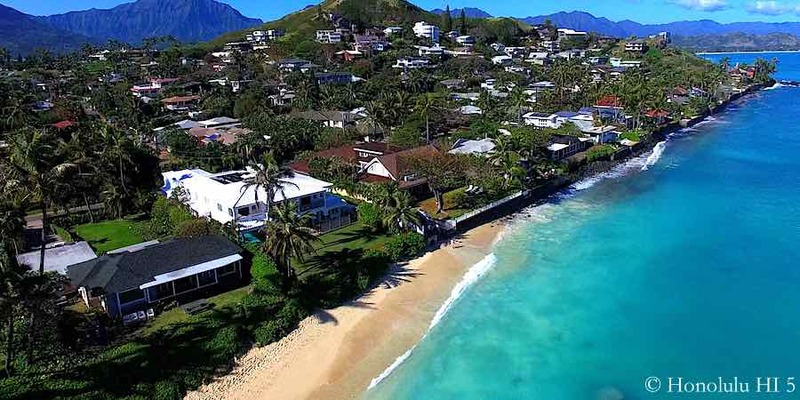 We’ve picked out 10 oceanfront neighborhoods on Oahu that we believe are the best, not just on the basis of the ocean views or recreation potential, but also the land-based factors, where you’ll spend most of your time. Here they are, but in no particular order, just 10 great places to live. 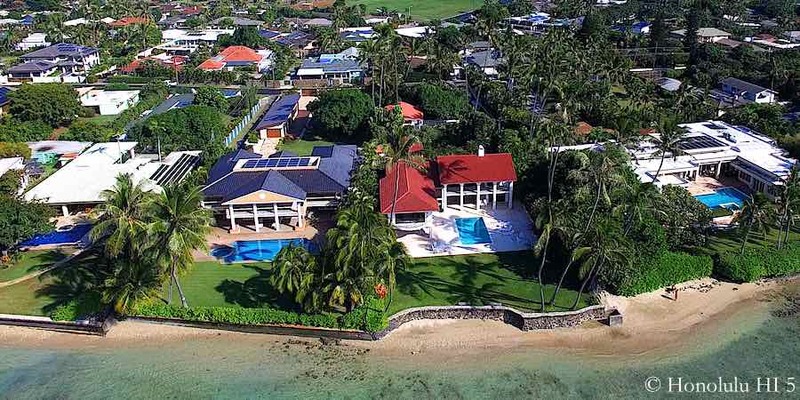 Kahala is known far and wide as THE luxury neighborhood on the Island, its name almost a shorthand for wealth. 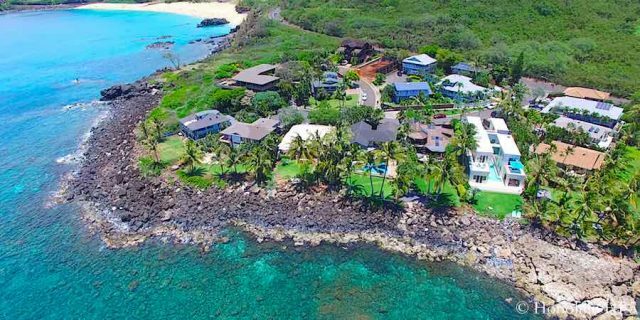 That’s justified, especially due to the huge beachfront mansions that line Kahala Avenue, their sales consistently in the multi-million dollar range. The surrounding streets are also filled with large, impressive houses including many vintage kamaaina homes that are iconic Hawaii residences. Though the beaches are not as good here, being smaller and often rockier, the scenery is still awesome. Here the oceanside lifestyle is more about quiet elegance, rather than the crowded activity of Waikiki. You come here to submerge yourself visually and spiritually in the beauty and serenity of this part of Paradise. That same atmosphere reigns over the entire neighborhood, with its distinctly low-rise landscape, wide and roomy streets, and large parks scattered within. You feel the greater spacing all around you, a huge contrast to many places on Oahu where, by necessity, everything is packed tightly together. Kahala is the high-end district its reputation projects, but when you can live by stunning ocean and all the grace and style that goes with these elegant homes, it’s no secret why this is one of our 10. As quiet as Kahala can be, it can’t compare, though, with Kawailoa North Shore. It’s roar of the ocean that will be your biggest noise concern here. Some of the most challenging surf is off your homestead here, bringing prime wave watching right to your windows. The home containing that window is probably one of extreme luxury, too. 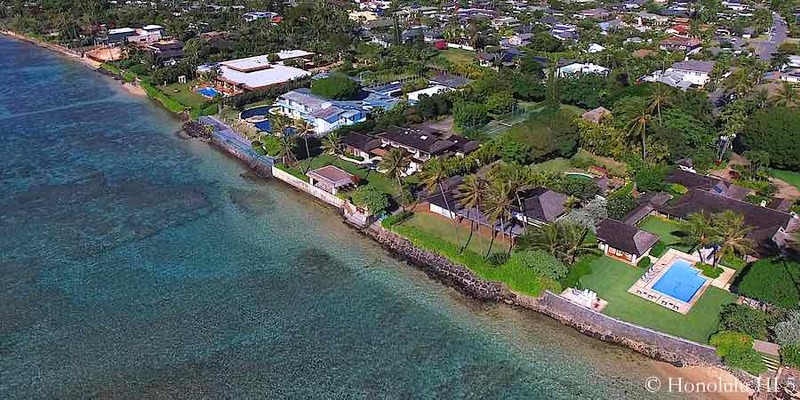 Turning off of Kamehameha Hwy, as you get more makai, the houses generally grow in size, beginning at 2,300 sq ft on these lots and climbing to an incredible 11,000+ sq ft. 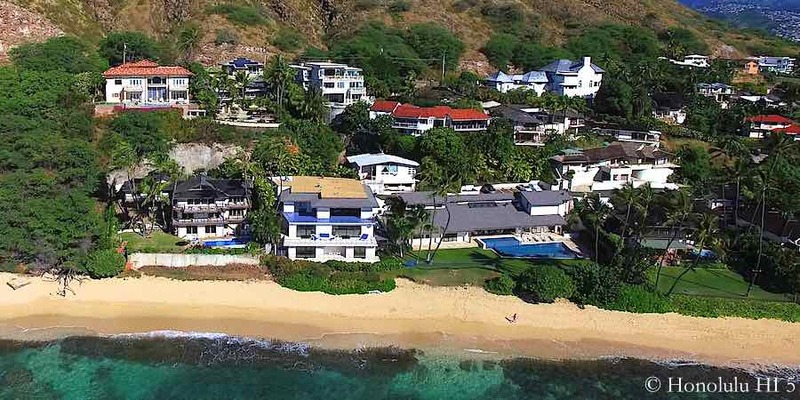 Though Kawailoa is not as commonly known across the Island as Kahala, those who are familiar with Oahu real estate understand exactly what its name stands for – big wave vistas, North Shore tranquility and amazing houses. Over half of these homes are oceanfront, making your chances of a front row view of the swells pretty good. Even those farther back, though, can often see the waters almost as well. Wherever you are and whatever your outlook, the ocean is a very few steps from your doorstep. Despite its lower name recognition, word is getting out about these homes and it’s all very, very good. Famously home to Shangri-La, Doris Duke’s incredible estate that is now a museum, it shouldn’t be any surprise that these are highly exclusive properties. Most of the houses are strictly private, sitting behind a gated entrance that few can get past. 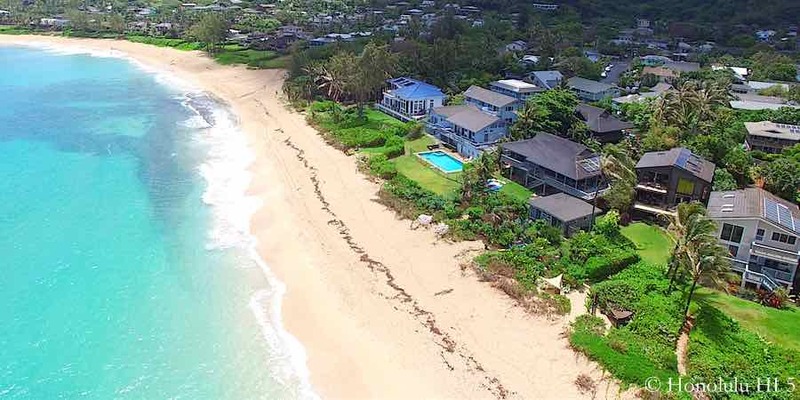 The residences are an intriguing mixture of vintage kamaaina homes, built for Hawaii’s elite in the 1920’s and 30’s, that, while not exceedingly large, are unmistakably the property of that privileged class. Alongside those you also see huge, modern mansions that typify everything that cutting-edge luxury is about. Many of the rich and famous live and vacation regularly in this community, attracted by the privacy and opulence – and they should know. However, that’s not the end of the allure of Black Point. Just off of these lands are some of the most famous surf breaks, including Cromwell’s, where Duke Kahanamoku rode the waves. There’s also no real beach, though. Instead, it’s the great strength and grandeur of the Pacific that draws you in. It’s an awe-inspiring show that never fails to impress. Black Point homes are a retreat from the world outside, into a select experience of dwelling in the height of luxury, beside an ocean untamed. Portlock makes up the eastern border of Maunalua Bay, hugging the waters as they head out to the open ocean. Its extension out from Hawaii Kai gives residents a head on view of the Oahu coast, with Diamond Head providing the crowning touch. Being something like a peninsula, you’re removed from the busyness of Kalanianaole Hwy. Portlock is not on the way to anywhere, ending with the Pacific on its far end, so traffic is reduced dramatically once you turn off the highway. The most exclusive houses sit right on the oceanfront, of course, all large mansions that date from the mid-20th Century to recent additions. They sit on very large lots, as do much of the homes set further back, spanning between 10,000 to 23,000 sq ft.
Like the rest of the immediate area, this is not a place to find sandy beaches. It is an oceanfront in the purest sense for the most part, but that brings its own benefits. Beaches would require public access, so without that presence, your privacy is fully secure. The homes on the land side of Portlock Road still enjoy the splendid outlooks on the waves and Diamond Head due to the sloping of the land here. On either side of that road, you live in a special place with unique vistas that take you out of the hubub of Honolulu and back to the peacefulness that has made this part of Oahu so attractive. Mokuleia is one of those prime ‘Let’s Get Away’ places, even for North Shore standards. It’s location on the west end of that coastline puts it out of range for any tourists as well as most locals. With everyone’s attention on Haleiwa and points east from there, Mokuleia residents rest easy knowing they’ll be left alone. Being off the beaten track doesn’t mean the scenery is any less enchanting. The beach that runs along the entire way easily ranks with the sands along the rest of the North Shore. In fact, the much smaller crowds, especially as you head west, may even raise their ratings. The many beachfront homes of Mokuleia gaze right out at the ocean, most with lanais so their owners can take it in fully at their leisure. Some may call this part of Oahu isolated, since you must drive into Haleiwa to do any shopping at all, but that’s also what draws a lot of buyers. It’s a beach lifestyle that, unlike so much of the Island, is truly off by itself, enjoying a less hurried and uncomplicated existence. Most of the homes here are large, but not mansions, underlining that this is an exclusive, but not excluding, kind of neighborhood. There are even a few condos here and there, some right on the beach. This is a remote part of Oahu, so it may not be for everyone. However, our bet is one visit to these shores will convert most into true believers. Sunset is a name synonymous with big waves and surfing, known worldwide for its swells that are awe-inspiring. Residents have been building homes here for decades to indulge their deep love affair with the ocean. Those who ideal home are the classic Surf Shacks, those smaller, distinctly North Shore style homes, will find them here – and they’re the real deal. Built in the decades of the mid-20th Century, they are the genuine Sunset beachlife experience, contained in 4 walls. If you’re looking for something of a later vintage and more creature comforts, that’s taken care of here, too. With the word spreading quickly about the lure of this coast, that quickly brought homebuyers who wanted, and could afford, a more substantial dwelling. Those large mansions, on extremely large oceanfront lots, are now a common sight in Sunset. Here, you can see live and in person the waves that regularly appear in surfing and travel magazines. When you can look out at these waters casting their immense power from your own home, it’s a soul stirring experience that few other sights can even hope to match. That’s the force behind life in Sunset, drawing us all in its wonderful wake. The two words in the name say it all. 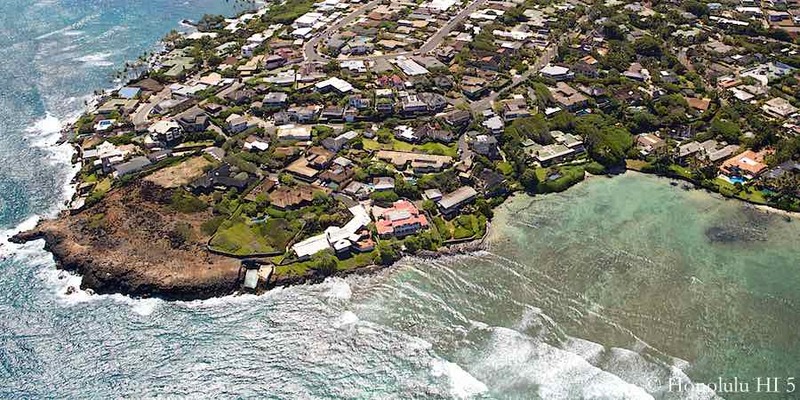 This neighborhood falls in the Windward showcase town of Kailua, right along its beach. Tell someone you live next to this shoreline and you’ll see what envy truly is. Being off of the main street along this part of the coast, Kalaheo Avenue, you live on one of the many side streets that run off of it and end right where you want it to, at the beach. That means, at most, you have a block between you and the waves. Many, of course, live right where grass turns into sand and sand into water. This long, roughly north to south stretch of shore gives views onto some of the most picturesque swells that stay fairly calm, fitting for the laid back mood of Kailua. That vista includes the famous Mokolua Islands, affectionally known as the ‘Mokes’, which give a particularly idyllic touch to the scene. Homes can vary greatly in size and style. You’ll find 1 bedroom cottages, many built in the middle of the 20th Century, that call back to a smaller, older Kailua. 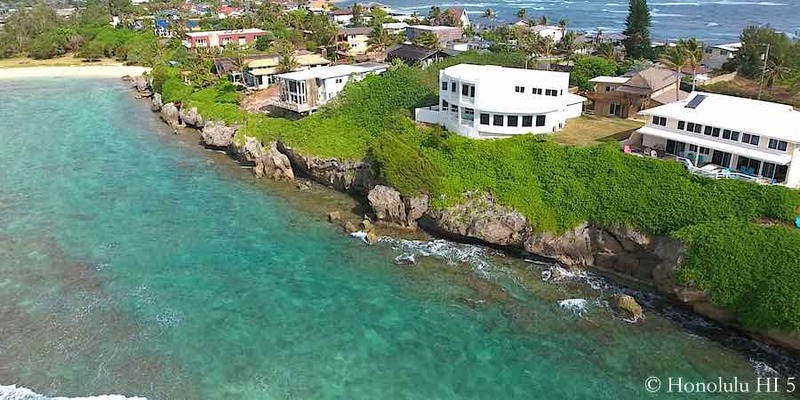 Yet up on the northern end of the neighborhood there’s also an especially upscale collection of beachfront luxury homes behind a gated entrance that truly embody modern high-end Island life. There’s everything in between in Beachside, too, but you can count on a higher price point at every level. When you can live near, or practically on, beachfront like this, the unquestionable laws of real estate must be followed. The good news is that it’s worth the cost, paying off in ways you can’t imagine until you live here. Nothing expresses just how magnetic the beauty of this place is more than the one thing locals associate it with – parking problems. Lanikai Beach draws crowds each and every weekend, compelled to come to this piece of the Windward Oahu coast and witness the exceptional ocean scenery. Part of the distinctive outlook off of these shores are the two Mokulua Islands that sit not far from the sands, providing a truly romantic South Pacific backdrop to the scene. The scenery doesn’t end with the outdoors. The houses in Lanikai are very well known, and regarded, for their elegant luxury, primarily in a tropical style that fits the setting perfectly. Features like open indoor/outdoor areas are often present to take full advantage of the richness of the vistas and the quiet Island atmosphere. Due to the slope of Lanikai the views are still clear as you go deeper into the neighborhood. In some ways it improves due to the higher elevations that open up more & more of the surrounding area. This is one of the Oahu real estate jewels, without question. The magnificent beach and ocean right there, the lavish homes and views that are incomparable. This is what Island dreams are made of. There’s a certain prestige in living beneath something that represents ‘Hawaii’ to people around the world. However, the real rewards for residents are the hours spent looking the other direction, to the Pacific’s active embrace of our Island. These waters aren’t just for show, either, they’re an actively used recreation area. Wave riders from all over descend down to the swells from Diamond Head Road every single day. 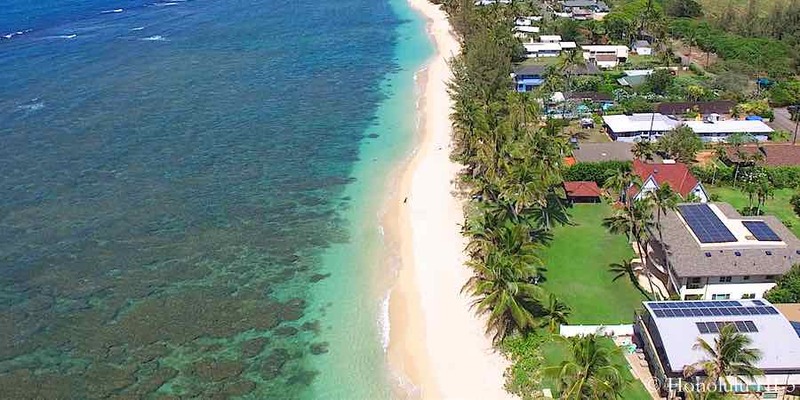 There’s also Kaimana Beach that locals have made their own, using it as a sun & fun space, but also as their launching pad by both long distance swimmers and stand up paddleboarders heading out to sea. Diamond Head homes are also know for what you see inside. Owners of these properties consistently have built the interiors to match the challenge of the scenery, with large dimensions and luxury features that embody convenience and comfort on a whole different level. From these lots you gaze to the ocean just as the Ancient Hawaiian lookouts watched for returning Alii or invading armies. They knew this was the key lookout from the Island. It still is now, even if it is for very different reasons. Laie sits on the northeastern side of Oahu, so high up that many include it in the North Shore. Whether it is or isn’t part of that coastline, it shares much of its approach to life. In Laie, things are taken slower and worries are things that will pass. 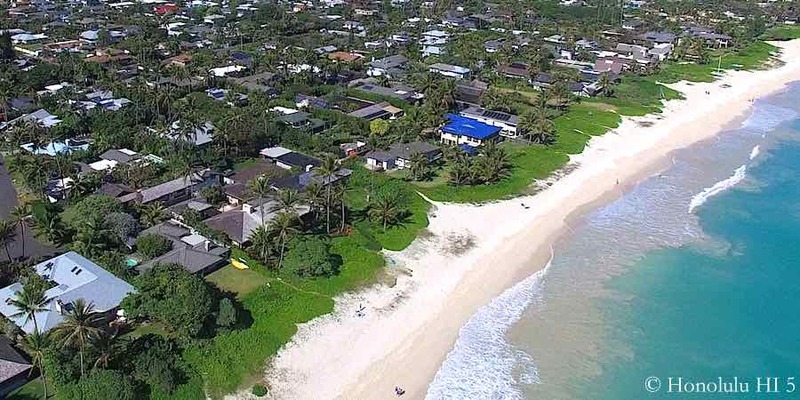 The town has a full range of properties, with many smaller homes, mainly away from the coastline, where many families have lived for generations, perpetuating the local ways and environment that characterize Laie. Closer, and even on, the oceanfront are larger residences, some which could be called estates. Some of these lots can be up to 3 acres of prime land right on untouched coastline. The most notable of the residential areas are on the Laniloa Peninsula, where you’re surrounded on 3 sides by the Pacific. Being on these lots is close to being on an exclusive Island, but without leaving behind the conveniences of Oahu’s mainland. In these homes the loudest noises are often the waves hitting against the shore, making a distinctive music that no one can resist. Any of these 10 will fulfill the enduring desire we all have to be by the ocean. To listen to the waves and imagine where they’ve been and where they’ll go. The surprise here is that there is such a variety of shades to the Oahu oceanfront home, colored by their location on the Island, the mood of the tides there and, of course, the life of the community around them. What is certain, however, is you’ll find living on these shores that your dreams aren’t just made there, you can actually live them.